Posted by Yilan in Czech Republic, France. The Czech Republic’s foreign minister on Saturday condemned France’s expulsion of Roma Gypsies and said he could not avoid the suspicion that ‘racist’ thinking played a part in the policy. “The way in which the President (Nicolas Sarkozy of France) is expelling Romanian citizens is contrary to the spirit of European Union rules,” said Karel Schwarzenberg, writing in the Prague daily Lidove Noviny. “One cannot avoid the suspicion that racist viewpoints are playing a role in this,” he said. The minister also criticised the way in which the debate on the issue was being held “without the new countries” of the EU, including the Czech Republic. “To have a debate without the countries where this problem most probably has its roots is a bizarre and erroneous idea,” he said. In the latest deportations, France on Thursday sent nearly 300 Roma back to Romania. France’s crackdown has sparked international criticism in recent weeks. The European Union is also examining the legality of the move and the Vatican has also spoken out against it. French ministers will travel to Brussels on Tuesday to discuss the situation with the European Commission, a commission spokesman said. Thursday’s expulsions brought the total number of Romanian and Bulgarian Roma deported so far this year to 8,313, up from 7,875 expelled throughout last year. 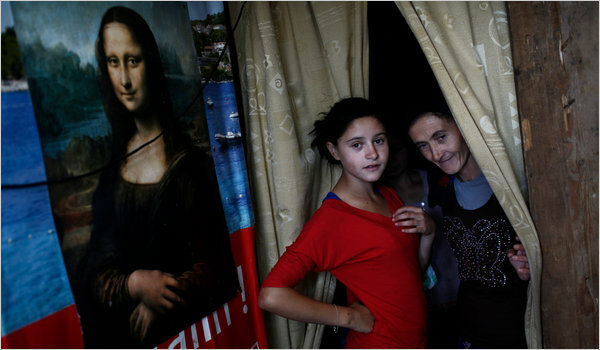 Earlier this month, Sarkozy announced that French authorities would dismantle some 300 unauthorised encampments used by both French Gypsies and members of the Roma minority born in Eastern Europe. Those foreign-born Gypsies found to be living on French soil without means to support themselves would be expelled back to Romania and Bulgaria, with those going voluntarily receiving small cash grants.